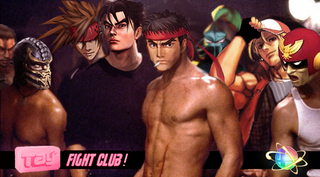 Fight Club - Smash Launch Day Edition! Hey all, welcome to a new kind of game night on TAY! Smash Bros. for 3DS has launched, and in our fervent and passionate need to pummel each others brains using Nintendo's greatest mascots, this little sector of the internet will be home for you to set up all sorts of matches for casual and competitive play! First off, add your fellow TAYers to your 3DSes! This list of fighters was gathered over two posts created by Sal and I. If you want me to add you to the list or you want to update info (such as your 3DS name), just post below and it will be edited for future Fight Clubs. Another place to find Gamer ID/account info can be found here.